3-wheeled or Linear Railed Modular X-carriage (D-Bot Core_XY 3D Printer) by printingSome is licensed under the Creative Commons - Attribution - Share Alike license. Edit 09-10-18 Cooling is replaced, see below. Now V2 (01/11/18. A print-carriage on 3 wheels or on a Linear Rail, to use with 3D-printers which use V Slot Extrusion rails, like D-Bot, J-Bot, etc. Linear Rail: Now the 2 upper wheels are replaced with a 400mm MGN9 rail + MGN9H block, just to know whether that gives just that bit improvement. Just replacing the wheels etc. with it and the "Linear Rail MGN9 Mount" should do the trick, without any other changes. The whole thing was inspired by and remixed from the famous and incredibly documented D-Bot of spauda01. But check: the plates are still 12mm wider and 7mm higher than the original of spauda01, because that gives somewhat easier access for (mounts of) accessories. The basic components haven't changed since march/april, most mounts have. (that has changed as of 12-02-18, see below. and I felt sorry etc., but when I saw the Zesty Nimbles I decided to chuck it. securely without some gear box, adding more mass). I prefer printing parts above buying them, but this time I decided to go for this concept which combines the best of 2 worlds: stepper on the frame and a light gearbox on the X-carriage, hopefully tightly enough connected in both directions with that cable. So you'll find modules for 2 ways of using the E3Dv6, the Cyclops, the Chimera: with bowden tubes and with Nimbles. 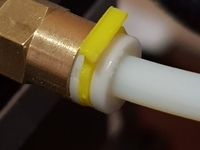 The diamond mount for bowden tubes only. There is a different fanduct for each setup, mounted on a common vertically adjustable slider. I chose for this solution to get as close as possible to the various hot ends. (When too close: easy to clip them a bit). These ducts are leaner then a previous version. At the moment I don't use the cable chain any more. It looks nice perhaps, but I still doubt whether it gives real advantage above other ways of conducting cables etc. With the nimbles there are 8 less wires to bring to the carriage, that convinced me to skip it, but I could easily imagine it still being of use in other configurations. For mounting the Chimera/Cyclops with 2 single nimbles I made the "Cyclops-Chimera Mount for 2 Nimbles on an original D-Bot and the 3-Wheeled X-Carriage" by printingSome, published Oct 8, 2017, https://www.thingiverse.com/thing:2574741. I preferred to buy 2 single nimbles in stead of the Dual Nimble in order to be more flexible for future endeavors. But of course you can use the "D-Bot Chimera/Cyclops adapter for the Dual Nimble using the printingSome carriage" by ZestyTech, published Jul 30, 2017, https://www.thingiverse.com/thing:2459458 too. 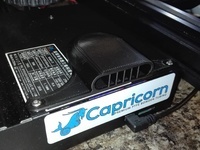 The corresponding fan ducts fit here also. N.B. The above sounds like I have commercial links with Zesty, but I don't. I am experimenting with those nimbles, have not even got really satisfactory results at the moment, without knowing what I do wrong, but I think they form a good proposition. 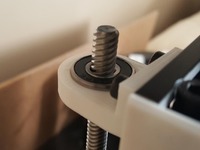 "E3D V6 HotEnd CAD Models (Includes all 3 versions)" by lXGaimMasterXl, published May 24, 2014, https://www.thingiverse.com/thing:341689, "Mockup of the Zesty Nimble: Lightweight direct drive extruder" by ZestyTech, published Oct 22, 2016, https://www.thingiverse.com/thing:1843195 and a mockup of a 20x40mm V-slot of Openbuilds which I can't find at the moment. Thanks. Edit (10/21/17): added some parts for a Linear Rail, changed this text and the Notes accordingly. Edit (10/29/17: V2 of Linear Rail Mount (V1 did agree with the nimbles) and added a M3-Nut_mount, to adapt to the new situation. Notes V6a explain it all. Edit (13/02/18) I added a new Rear Plate: "CarriageRear(Belt_Tensioner_Version)", inspired on "D-Bot Carriage Rear Plate with Adjustable Belt Tensioner" by 1sPiRe, https://www.thingiverse.com/thing:2376442 and Separate GT2 belt tensioner" by MrArrow1961, https://www.thingiverse.com/thing:910725. The most important feature would be that one can adjust the angle between the X-axis and the Y-axis by adjusting the belt-tensions with bolts. While the effect on that angle in practice is less then I expected it makes it also easier to (un)mount and adjust the tension on the belts. With it come the "Belt_Tensioner" and a new Part 2 of the fan mounts the "Fan_Mount_Pt2-Belt_Tensioner_Version" because the other one didn't fit any more. That has become better to mount in the process. All fan mounts Pt1 fit on this, with only a 4mm bigger distance from the hot end. I suppose that in time I will remove the older rear plate, because I consider this one far better, despite the fact that it needs a bit of t.l.c. after printing without support to get a nice and easy fit of the tensioner into its house. See also the Notes. Edit (02/04/18) moved fan reduction files from the complete printer here. 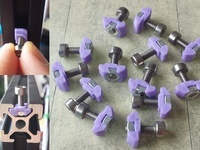 To use, together with a moulded fan housing guard, for the E3D V6 HotEnd. Edit (07/04/18) updated some pictures. Edit (20/06/18) added a Berd-Air-pipe_Mount, to use with my nimbles mount, see Notes. Edit (01/11/18) Directed the air flow from the blower fans downward -> V2 of Pt1 and stiffened Pt2 a bit ->V2. Adapted the Notes ->V8.